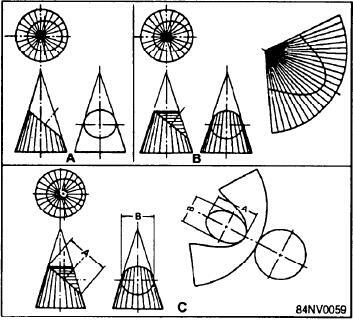 Figure 14-53.--Development of a truncated right cone. Figure 14-50.--Development of a truncated pyramid. Figure 14-54.--Development by triangulation of a transition piece. sides of each triangle from the views (view C). Draw the upper edges to complete the drawing. orthographic views and projected to the development. upper edge of the peripheral surface (view B). outside lines to determine their true lengths. done by drawing a true-length diagram.